You never want to make too much out of one poll result, but this one seemed worth noting. Public dissatisfaction with the tax system has grown over the past decade, and the focus of the public’s frustration is not how much they themselves pay, but rather the impression that wealthy people are not paying their fair share. 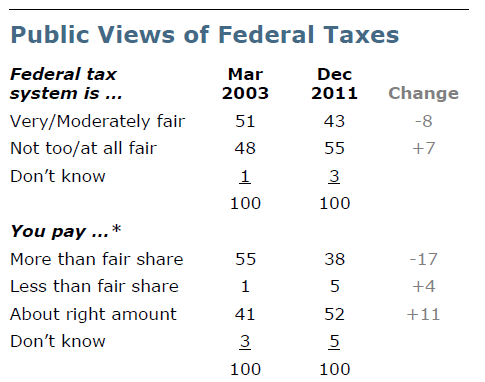 Note the table below, showing a 17 percentage point decline in respondents saying they pay “more than their fair share.” This makes empirical sense, as federal tax liabilities have fallen considerably in recent years, both due to policy changes (Bush tax cuts) and more recently, the recession, leading to lower incomes and large capital losses. But that’s a big drop. As noted, other results in this poll show an increase in the share of people who feel the wealthy aren’t paying their fair share, and that’s not a one-shot finding–many other polls corroborate this sentiment. That led me to reflect on the payroll/UI stalemate still gripping DC politics. The reason the R’s and D’s couldn’t close the deal for a full one-year package was not because they didn’t believe it was good stimulus, or at least good politics to cut a tax. It was because they couldn’t agree on how to pay for it. The only payfor on which they could agree—a higher fee to Freddie and Fannie for insuring mortgages—only paid for two months of UI and payroll tax extensions (and the Medicare provider fix). I’ve made the radical suggestion that temporary measures need not be paid for at a time like this—because they’re temporary, they have almost no impact of the medium term deficit. But that argument has no traction right now. So here’s the thing. If you insist on paying for even temporary spending measures and you take any new revenues off the table, then you’re insisting on cutting spending, and so far, all we’ve done is cut. The Budget Control Act cut more than $2 trillion in spending so far—about $1 trillion when it was signed, and another $1.2 trillion through the sequester when the supercommittee crashed and burned. D’s pretty quickly punted on tapping a millionaire’s surcharge tax to pay for UI/payroll. That may have made sense given the need for quick compromise to get the package through the Senate with bipartisan support…which in fact worked well—89 senators, including 39 R’s, voted for the compromise. When has that happened in recent memory? But looking at this poll result this AM I was again reminded that these deals really need balance in terms of new revenues, and more progressive taxation is widely supported by the public. To fail to recognize and implement such balance is to keep slashing away at federal spending with little regard for the damage that’s doing to government’s ability to meet the needs of the people. Share the post "Re Progressive Taxation, the People Get It"
One comment in reply to "Re Progressive Taxation, the People Get It"
It appears Dems have Indepenents on their side on this issue, if they choose to push it in the next round of payroll tax cuts. Also,OWS may be having an effect: the overall support of this view increased 7 points since 2003. I wonder if this was mainly among Dems or included Independents. The public report does not say.